I have been reviewing my workouts since the beginning of the year, in an attempt to unearth progress and setbacks during this 5 month period. Because of hernia and eye operations during the first half of last year, I had spent the second half of 2013 doing a lot of easy running. I was injury free. In January of this year, I began to do some speedwork, but at a 2 mile pace, rather than an 800 meter one. 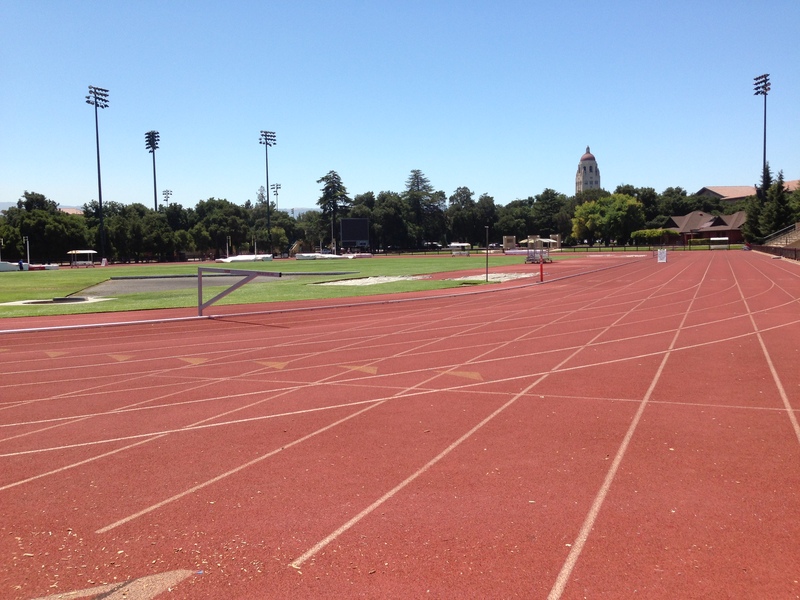 I was doing 200s, 300s and 400s, usually 4 or 5 repeats, with a 2 to 3 minute rest interval, depending on how I felt. I got through January injury free. At the beginning of February, I began to increase the speed of my repeats to my 800 meter pace and I dropped the rest interval to the 2 minute range, but still did 4 or 5 repeats. I felt very good during these repeats. On February 27 I felt excellent, having rested 3 days, but on the 4th 200 meter repeat, my left glute cramped at about the 80 meter mark, so I stopped. I rested 90 seconds, then ran 100 meters at my slower 2 mile pace, rested 2 ½ minutes, and then ran one more 100 meters at the 2 mile pace. I prayed I wasn’t injured too seriously. The glute pain has flared up only periodically over the next few months, so I was probably pushing the speed a bit too much on February 27. Perhaps we Senior Runners need to gradually ramp up the speed and gradually reduce the time of the rest interval. This injury is not as bad as in the past, but I’d rather be running injury-free! I bet you would too!! During March, I dialed my interval training back in speed and increased the rest interval, did a couple of longer, slower runs than normal, cut back my 5 minute tempo run to 1 or 2 repeats, and did several easy 45 minute gym workouts. As I mentioned my glute ached occasionally, and I also noticed my average heart rate and my peak heart rate were higher than normal. My guess is that my body was telling me I was not recovered enough from the previous workout and that my body had not yet healed the glute. My heart rate remained elevated for most of April, but then on April 30, I did a combination of 200 meter and 100 meter repeats, with 2 minute rest intervals between, and my average and peak heart rates dropped back town to their historic levels. That told me I was finally at the correct intensity and recovery days balance. During the first half of May I traveled quite a bit, but I managed good tempo runs and 100 meter repeats. I was very pleased I could handle both kinds of workouts without glute pain. However, during the trip back from Frankfurt, Germany to San Francisco, the artificial lens in my right eye slipped out of place and needs to be re-secured. This will take place soon. The doctor advised me to stop running until at least a week after the surgery, and I am hoping this forced layoff will allow my body to completely heal. Also important is measuring your heart rate during your recovery period when interval training, before you start the next repeat. Again, this is hard to quantify; over time you can determine what your current rest interval should be, if you truly pay attention to your body. I would discuss all of this with your doctor for guidance in your particular situation. I would also suggest you invest in a heart monitor to make your rates easier to track.